Dr. Homi Bhabha Competition Test Series brings for the first time, more than 3500 questions to practice. Dr. Homi Bhabha Competition Test Series. Homibhabhacompetition.com website is a comprehensive site for information on Dr. Homi Bhabha Balvaidnyanik Spardha conducted by Mumbai Science Teachers Association. 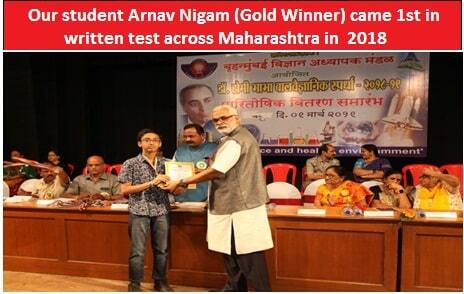 More than 40000 Students appear for this examination every year in Maharashtra. Dr. Homi Bhabha Balvaidnyanik Spardha is an excellent way to make a strong foundation for Science subject. It will help the student to be much ahead in the science knowledge .The competition consists of Written Test, Practical Work and Project work. Students who will be in 6th and 9th Standard in the year 2018-19 are eligible for the examination. Pallavi Jagtap -My son did not appear for any coaching classes . Simply relied on Homi bhabha Online test series . Sarthika Mungase - 10 stars for your test series. Sandra Moses - The question bank was really helpful.I will give 9 out of 10. Shriya Subeerya - I will rate the content as 9 out of 10.I would like to thank you for the guidance in written test. Gurvinder Kaur Dua - The test series were very helpful in the preparation process.Will join again next year for my son! Bhagyashree Patwardhan - The test series proved to be really beneficial(I would give it 10 out of 10) and helped her to score 75 marks in theory exam. Aarohi Mehta - It was a good experience and the test series was helpful to revise concepts. I would rate it at 9-9.5/10. Prasad Pore - We liked the schedule of tests. Because of the schedule she could finish vast syllabus in time. "What you get from Our Test Series "
Guidance in Registering and Enrolling for Examination An extensive test series consisting of 70 Question papers with more than 3500 Questions for preparation of Dr. Homi Bhabha Balvaidnyanik Competition. Please get in touch with us immediately as lot of students will start studying for the Examination. We believe every student is a winner. They need proper direction and right approach to be successful. Homi Bhabha Competition 's test series is to bring out winning qualities in each student. "When You are not practicing, remember,someone somewhere is practicing, and when you meet him he will win"
Highly trained team with experience in the Homi Bhabha Competitive exam papers. Focused towards giving maximum practice to students for Homi Bhabha Exams.